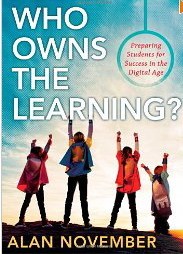 I’ve joined a group of bloggers to discuss the book “Who Owns the Learning?” this summer. I have to admit that I joined without reading the subtitle and therefore thought the book was about literacy and how students can make choices in reading and writing. But the subtitle is “Preparing Students for Success in the Digital Age” — so it is yet another techy book (not my usual cup of tea.) However, having read the introduction and the first two chapters, I’m hooked. The author, Alan November, encourages “autonomy, mastery, and purpose” in all learning (words he gets from Daniel Pink’s work.) I couldn’t agree more. We can motivate kids to learn much better if we allow them to make choices and help them see a purpose for their learning. 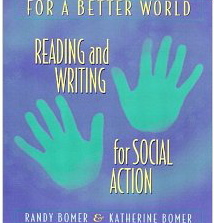 November’s emphasis on building community beyond the classroom to foster “global empathy” reminds me of the book For a Better World: Reading and Writing for Social Action by Randy and Katherine Bomer (which, if you’ve never read, I highly recommend.) Both books give many middle school and high school examples, yet I still find enough to relate to elementary schools. I can see kids using VoiceThread as Katie Keier does in her kindergarten class to share ideas of what they liked about a particular picture book. I definitely agree with Jill Fisch who said in her blog that she would love to see more examples from primary grades. 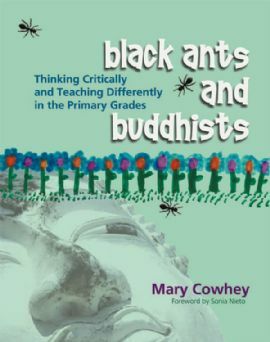 In fact, I would love to know how Mary Cowhey (author of Black Ants and Buddhists) would incorporate the ideas from this book into her classroom. She already has such a great handle on teaching empathy, celebrating diversity, developing community, solving problems collaboratively, and so on, to her first graders. Although Alan November is aware of the gap that exists because of poverty issues and the problems that would develop because of lack of access to technology, I’m not sure his suggestions would be enough (he discusses this on pages 22 and 34-5). I fear the gap getting bigger and bigger with his Digital Learning Farm concepts. It’s not just a matter of giving poor families access to a computer and the internet (he suggest having flexible librarian times and keeping libraries and computer rooms open to communities). We would need much more to bridge the gap as there are many illiterate parents, many parents who speak another language, many parents who are uncomfortable coming into schools, and so on. Despite the drawbacks, I am still intrigued by the many examples of teachers allowing students to create some of the curriculum, achieve mastery of various topics in order to teach others, and find purpose in their education. I will read on to learn more about how students take on the roles of scribe, researcher, and global communicator and collaborator. So glad you are joining #cyberpd again this year. You should know that many of us did not have this book on our list at first but after browsing lists that others created and having some conversations on Twitter, this became the book that we really wanted to read this summer. I loved your point about student tutorials not possibly becoming too “item oriented”. That is something important to think about. I also was glad to see you share “Black Ants and Buddhists”. I ordered that as part of my summer reading and can’t wait to dig into it, too. I’m sorry to be so slow to get around to comment on your post, but I must say how much I enjoyed your honesty and thoughtful consideration of the ideas. I’m hoping you will maintain a literacy lens throughout this conversation. This book is a little different from books we’ve chosen in the past. We wanted a book that had a large range of audience, but it is probably one that primary teachers have to really work the most to connect. That’s the part I’m enjoying; seeing the way primary teachers are thinking about this book and how it will impact their learning communities. I really liked your points about poverty and would love to hear some of your thoughts on bridging this gap. I worry sometimes that students in high poverty schools receive more skill based instruction, and believe opportunities to connect, create, and collaborate with those beyond their classrooms would allow them to grow as learners and showcase their strengths. Perhaps bringing down socioeconomic barriers a bit? Glad to have your voice ALWAYS! Continuing the conversation about Who Owns the Learning?